This blog post is a gift to my mother, whose birthday is April 21st. And in loving memory of my grandmother, Grace Everett, whose birthday is the 27th. The field guides were kept in the dining room. Not obtrusively on the kitchen table or counter, but just around the corner, accessible to a quick eye and step. I can’t say I was raised with them, not exactly. Not any more, anyway, than I was raised with frequent dictionary consultations, which came at home year-round, during dinner and other times. The field guides were a summertime thing, a July thing, a component of that month-every-summer with my grandparents on eastern Long Island. As much a part of summertime life as the pineapple wallpaper in the bedroom. Mostly, I think, it was the bird and wildflower guides we used, evidence of which is here and there in marker on the pages: my initials, my cousin’s, a sister’s, followed by the date. Apparently Meghan and I both discovered a Lady Slipper on 6/13/76; Meghan alone found the Trailing Arbutus on the same day. Our cousin Nathaniel found Chicory on 9/9/78. His initials appear with the date on page 75, written in ballpoint in my grandmother’s fluent script. And on page 38, where my initials (no date) also appear, my grandmother has noted (9/20/78) the Knotweed, underscoring “Smartweed” in the paragraph description, and adding the words “long bristled” in the margin.With my initials in yellow, I laid claim to discovering Crowned Vetch (p. 59); but I recorded no date, and I wonder if that was a nod at honesty, as that vining weed covered the entirety of my neighbor’s backyard hill in Pittsburgh. My grandparents knew the names of birds and trees, of wildflowers and mollusks. Such knowledge–and an interest in it–was an extension of who they were. As important as knowing words (and their definitions); as knowing how to use “lay” and “lie” correctly. As knowing all the books of the Bible– in order, of course. It wasn’t that they ever lectured on the value of knowing; they just knew. And if they didn’t, they looked it up. Hence the field guides on the bookcase in the dining room. 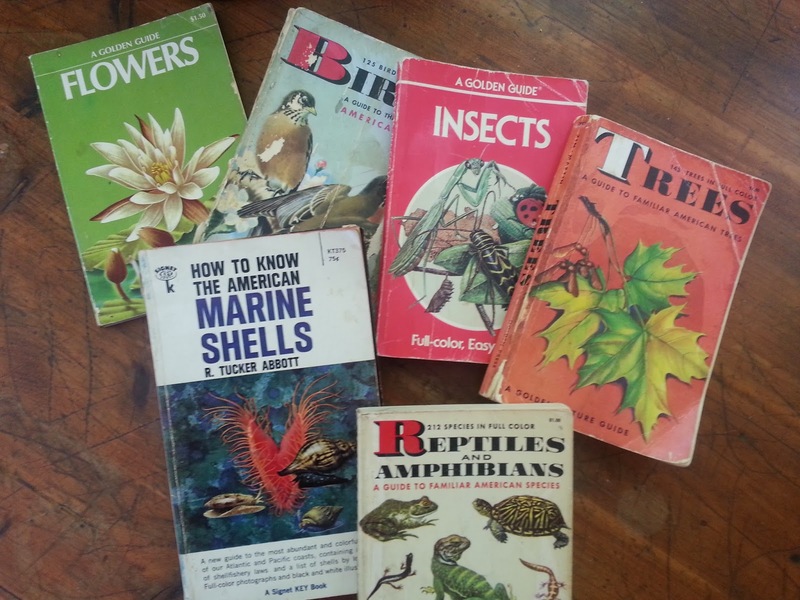 I have inherited these field guides, and Birds: a Guide to the Most Familiar American Birds often lives on (rather than in) our home school cabinet in the breakfast room. (On December 29, 1960, my grandfather spotted a Bobwhite; on the seventh of that same month, my grandmother saw a Yellow-Shafted Flicker.) This recent winter, Emma and I worked at keeping our window bird feeder filled, hoping that we’d learn something (someone?) new. But mostly it was the regulars: cardinal, chickadee, tufted titmouse, bluejay. Birds my children already know because I taught them, because my grandparents (and parents) taught me. What is the value in knowing these names? There are few people we are likely to impress. But there is yet something satisfying in it. Something of Adam, maybe, or Aristotle: to name is to know? To love? But why do I want to know? Why do I want my children to know? With all that is necessary in life, all that is going on both here and abroad, what is the value in alleviating this (small and insignificant) ignorance? They–the world–can get along quite nicely, thank you, amid unknown flora and fauna. So many people live in cities, in high-rises, surrounded by concrete and macadam. Squirrel. Pigeon…. Pigeon. Nonetheless, the interest grows. In these recent weeks, the effort to name has taken on new dimension for me. This year, watching the greening of the spring world, I have been attending anew to the trees. While throughout the winter their identity, distinguishable (somewhat?) by dun trunk and branch, seems (to me) unknowable and even irrelevant, their leaves’ emergence exposes them for what they are. Lately I am trying to name them–and the color of their green. “Green,” a word that covers but can’t epitomize what I’m seeing. Because the color of the newborn locust leaves is not the same as the crabapple. And the Bradford pears have been, by comparison, a dark green for the better part of the month. Meanwhile, the pendant seeds of the pin oak make that tree’s leaves look almost white. The leaves of the backyard maple are fair. 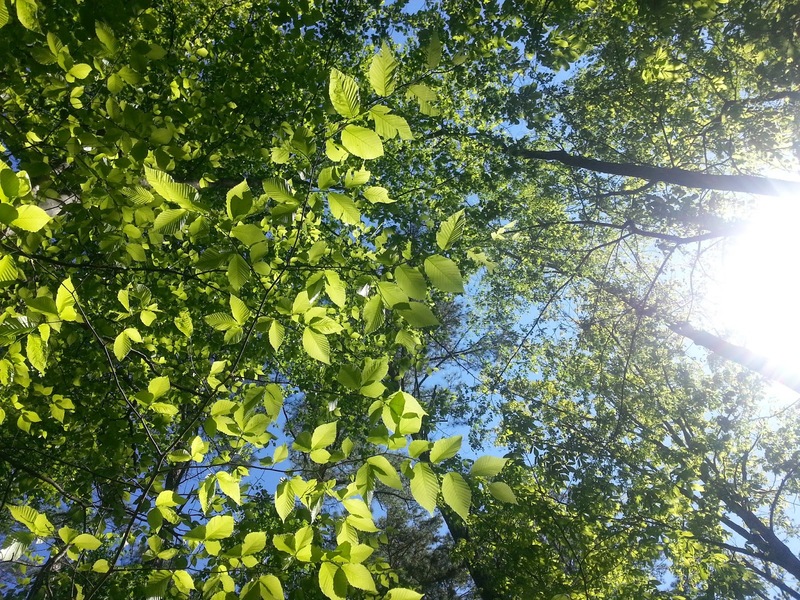 And the distant tulip tree, whose uppermost branches I watch all summer from my kitchen sink window, might be that Crayola spring green I’ve known since I was six. I find myself reaching for more names. Is there a field guide for green? Celadon, chartreuse, the silver tint of sage. The rich depth of emerald, the blue-bordered jade, the pale and honest shock of peridot. It’s a new and not entirely safe enterprise, this effort to claim names for tree and leaf color together as I’m driving down the road. I think I’ve got it: lime! loden! in what I know is birch; but by the time I name it, the tree and its color are gone, replaced by maple, by white oak, by pin oak, by … oak. All of them turning green. I imagine I can do a better job staring out my bedroom window. I–and the trees–are standing still now, but it’s nonetheless difficult to bring them into focus. The trees appear in layers, this one and that one closer to or further from the house, strata of leaves in stages of emergence, layers playing tricks on my eyes. What is it with naming anyway? To identify, to classify, to pin it down in construct of consonant and vowel. The leaves and their color come on without me, they will emerge and expand, and it will matter little or not at all that this afternoon at 3:46 that leaf was the shade of an avocado. The inside of an avocado, to be specific. Guacamole green. The morning light is coming through the kitchen window above the sink. It catches and hangs on the leaves of the forsythia branch I brought in some weeks ago. The golden yellow blossoms have dropped away, but there is the green of the serrated leaves, all lit up with the sun. This illumination catches my eye and I hang there for a moment, studying blade and vein, the faint polygonal structure of its surface. Words rise and cluster in my brain: photosynthesis, chlorophyll, chloroplast. And then, just beyond the window sill, the wind hits and the newborn leaves answer. The sun strikes them. They are diaphanous, incandescent, a shifting, glowing mass of light-bearing green. All words leave me, save some chorused by an organ, sung by the congregation-choir of my grandparents’ church there on the eastern end of Long Island, so many summers, every summer of my life. There is something to naming that opens the eyes. That’s what it is. It’s when we know it that we see it–and not the other way round. Was this what my grandparents knew? Teaching me–so early–to open my eyes. Helping me to see things seen and unseen. To love. And then, so naturally, to praise.